Rest assured, you are in good hands when you get a tattoo in our tattoo shop in Amsterdam. 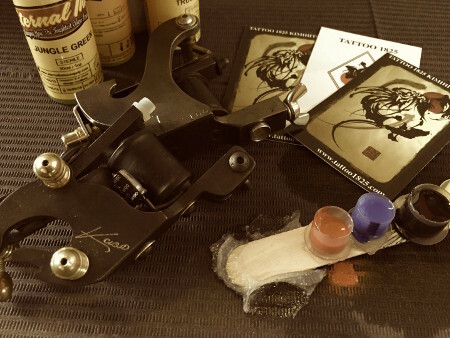 Our years of experience as tattoo artists in various countries have given us not only the skills to create outstanding designs, but also the experience to work with different kinds of people and understand what they want. At our Amsterdam tattoo shop, we work with not only local clients, but also people from all over the Netherlands and abroad. A tattoo is forever, so we devote a lot of time discussing it with the client. Only when we are both 100% satisfied with the proposed motif do we start the actual work. And for your peace of mind, we conform to all the strict standards of tattoo hygiene and safety, as laid down by the Dutch National Center for Hygiene and Safety (LCHV). We use a disposable safety barrier during the tattoo application process, and all our needles, tubes, ink, cups, grips, gloves, etc. are disposable.